Earlier this week my wonderful friend Cat came over for dinner. Even though this “party” was only the two of us, the principles of easy entertaining still applies. The major principal, any time you are executing a meal with more than 1 course, is to make it easy on yourself! By that I mean balance labor intensive dishes with non. The non can either be made-in-advance, store-bought or just prepped in advance. Either way, my key to being a sane hostess is simply to balance the mind-less and the mind-full. In the case of my dinner with Cat, I balanced this amazing Salmon Salad with Fennel, Orange and Mint (above) with store-bought Ravioli and Vodka Sauce (below). Although in this case the Salmon Salad was my “intensive” dish it actually qualifies as a good “make ahead”. 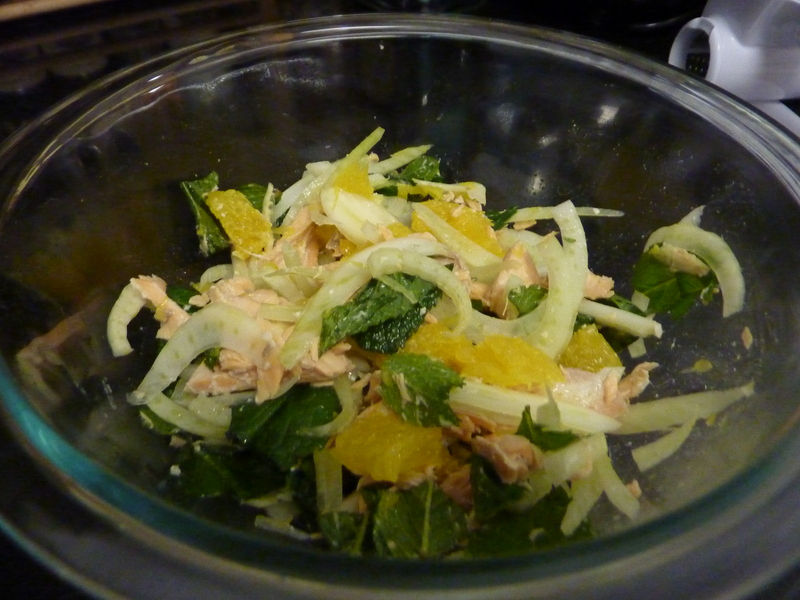 You can chop the fennel, mint and orange while the salmon poaches and let the salmon cool while you are entertaining. Then everything goes in a bowl and voila – your 1st course is served! Place sugar, vinegar, star anise and cold water in a skillet or large saucepan (whichever you have that has a lid!). Bring to boil over high heat, stirring until sugar dissolves and let reduce for an additional 5 minutes. Add salmon fillet, skin side up. Cover skillet/saucepan and remove from heat. Let stand 10 minutes. Using slotted spoon, turn salmon over; cover and let stand until salmon is just opaque in center, 10 minutes longer (our piece of salmon was very thick, yours may only take 15 minutes total). Remove salmon from liquid and cool. Flake salmon into medium bowl, removing any bones and skin. Cut top and bottom 1/4 inch off each orange. Stand 1 orange on 1 flat end. Using small sharp knife, cut off peel and white pith. Working over large bowl (this will be your tossing and serving bowl), cut between membranes, releasing segments into bowl. Repeat with remaining orange. Add salmon, fennel, mint, and olive oil. Gently toss to combine. Add S&P to taste. Honestly the Salmon Salad is a very Spring/Summery dish – it is incredibly light and refreshing. 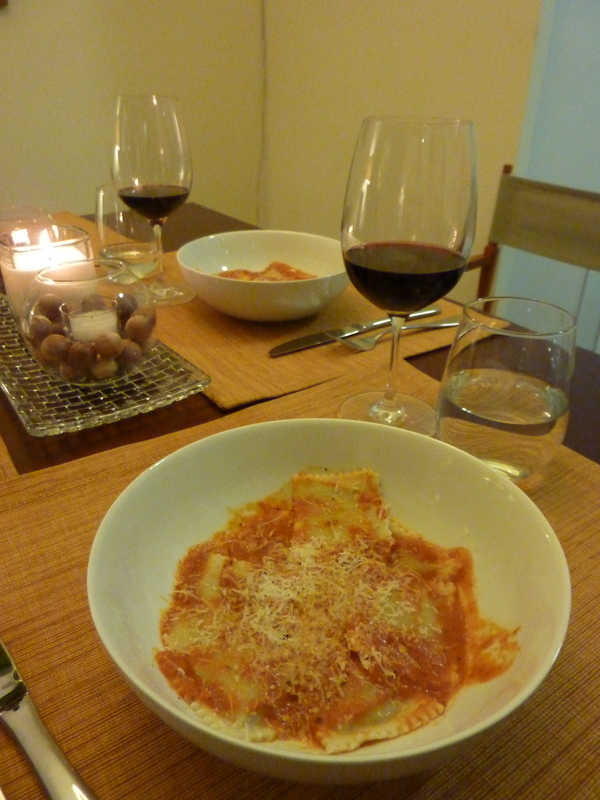 With that said I was surprised how easy the transition was to classic Ravioli with Vodka sauce. It was almost as if the salmon cleansed our palate to settle in for a winter’s meal! We used two types of Ravioli: Portobello Mushroom as well as Gorgonzola & Walnut. Both types, as well as the Vodka Sauce, came from The Amish Market. Although Cat pointed out that she can get the same ravioli at Fairway (lucky Brooklynites)! Mixed together and topped with grated Parmesan this pasta course could really not be any easier! 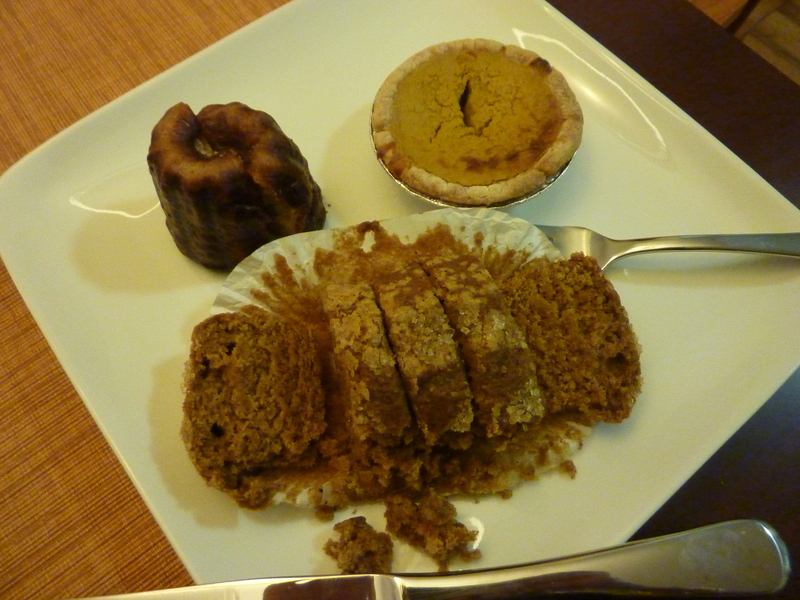 Finally we ended the meal with wonderful treats from the Sullivan Street Bakery – thanks Cat! Such a satisfying meal, that really was just that easy. This entry was posted in Culinary Adventures, Entertaining and tagged easy, Easy Entertaining, Epicurious, Ravioli, recipe, Salmon. Bookmark the permalink.